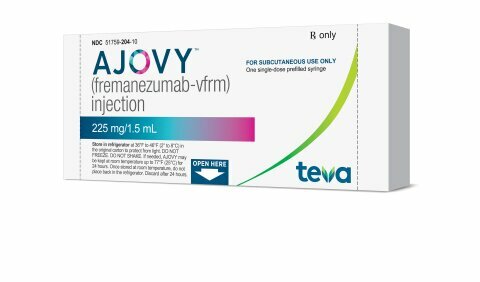 Ajovy FDA approval : Israeli pharma company Teva Pharmaceutical Industries has bagged the US Food and Drug Administration (FDA) approval for Ajovy (fremanezumab-vfrm) injection to be used for migraine prevention in adults. A humanized monoclonal antibody, Ajovy binds to calcitonin gene-related peptide (CGRP) ligand and prevents its binding to the receptor. The Ajovy FDA approval means that the Teva migraine drug is the first anti-CGRP treatment to be approved in the US for migraine prevention with quarterly (675 mg) and monthly (225 mg) dosing options. Commenting on the Teva migraine drug Ajovy FDA approval for migraine prevention, Stephen Silberstein – the lead investigator of the phase 3 program for Ajovy, said: “Migraine is a disabling neurological disease that affects more than 36 million people in the United States. The Teva migraine drug Ajovy was assessed in a couple of phase 3, placebo-controlled in patients with disabling migraine. Ajovy was evaluated as stand-alone for migraine prevention and also in combination with oral preventive treatments. According to Teva, the enrolled patients had shown a reduction in monthly migraine days during a 12-week period following the treatment with Ajovy with the most common adverse reactions being injection site reactions. Kare Schultz – President and CEO of Teva, commenting on Ajovy FDA approval, said: “This is an important day for Teva and complements our long-standing history of helping patients living with diseases of the central nervous system. The Israeli pharma company said that its migraine drug Ajovy will be available as a 225 mg/1.5mL single dose injection in a prefilled syringe. It will come with two dosing options 225 mg monthly to be given as one subcutaneous injection or 675 mg every three month as three subcutaneous injections for migraine prevention.